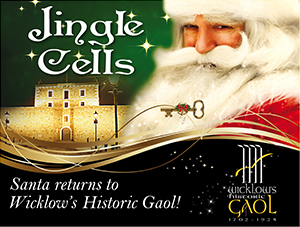 It’s Jingle Cells as Santa returns to Wicklow’s Historic Gaol! It’s Jingle Cells all the way with the return of our beloved Santa Claus to Wicklow Gaol from Saturday 6th of December. Hassle-free Santa visits away from the crowded bustle of the city are the name of the game, with free facepainting and our charming elf to get you into the festive spirit. Once again the spectacular lighting that the Gaol has become renowned for far and wide will enchant little ones as they prepare to meet our beloved Santa. On Saturdays, visitors can partake in pony and trap sleigh rides starting from the Gaol and circling the town. Free facepainting takes place all weekend to add to the excitement and festive spirit. Mum and Dad will also be well-catered for at the Jailer’s Rest Bistro and Wine Bar. Drop in for a festive glass of wine and a Christmas treat or book in for a delicious Christmas dining experience in this most unique venue. Saturday and Sunday (6th and 7th December; 13th and 14th December and 20th and 21stDecember) 2-7pm.